Postmodernity, Secularism and Pluralism are three topics often discussed in relation to understanding the changes that have taken place in society and the lives of individuals in the last half of a century but they are rarely brought together. David Lose provides an incredibly useful introduction to three of the major influences that are shaping the world of the people both inside and outside of congregations and in a brief and helpful way illuminates the impact of these three massive shifts in the way the world is viewed and identity is constructed. In addition to being a descriptive book, where the nature of a postmodern, secular and pluralistic world is described, the book is also suggestive in responding to how a preacher might constructively engage each of the challenges and opportunities presented by our changing world. Dr. Lose’s proposal in this book is that rather than looking at preaching through a list of problems that are described and solutions that are prescribed to look at the mystery of preaching and the questions of our age. He invites the reader to enter into, “an ongoing, curious, and lively engagement with the questions that people living at particular times are asking” and then enter into the questions of the current age and understand those questions so as to speak from the mystery and wisdom of faith to those questions in a way that is helpful. (6) The structure of Preaching at the Crossroads deals with each of the three topics with two chapters, one descriptive and one suggestive. In each descriptive chapter the author describes the way each influence is seen in our daily lives and how it impacts the way the church has been able to interact with the world and the second chapter he presents some hopeful suggestions for the road ahead. Postmodernity is the subject of the first two chapters of the book and in a very quick manner David Lose describes both postmodernity and its predecessor modernity (since postmodernity is a deconstruction of modernity). Modernity depended on rational verifiability as the standard of truth in an ordered world that was searching for certainty in rising scientific and technological revolutions that spanned several centuries. Postmodernism emerges from the disappointment with the costs of the modern age and as a skepticism about the ability of humanity to solve the crises of the world through reason, science, industry and technology. Where modernity sought some unified truth, postmodernity would say there is no unified reality or truth but rather truth has often been the values of the dominant culture. Postmodernity view language and culture are not merely descriptive of reality but are forces that are utilized in the construction of reality and instead of Francis Bacon’s famous dictum “knowledge is power” the postmodern philosopher Michael Foucault reverses this to “power is knowledge.” (18) In a postmodern world where all truth is at best penultimate and that the foundations which our truth and knowledge is based upon may need to be revised in the light of a more plausible alternative. The postmodern world is one of competing stories and narratives of which the Christian story is merely one possible narrative whose validity must be proven through interface with the hearer’s experiences and contact with other competing narratives. In a world where the certainties that humanity can save itself through continued progress and development are stripped away it calls for a different preaching that is willing to courageously wager about God’s engagement of the world and to see how that narrative is received in the experience of the postmodern hearer. Following Paul Ricoeur’s move of employing a hermeneutic of suspicion and trust simultaneously David Lose invites the preacher to consider a centered, communal, and humble approach to preaching. Secularism is dealt with in chapters three and four of Preaching at the Crossroads. While postmodernity questions modernity’s assumption that humanity can save itself secularism represents a loss of confidence in the divine to allow humanity to escape from its crises. It is a world where the immanent has triumphed over the transcendent and the religious stories that once helped individuals look outward for their sources of meaning no longer have the same power forcing people to turn inward on their quest for meaning and identity. Where postmodernity presented the Christian faith with a crisis of authority secularism present that same faith a crisis of relevance. Many feel that with the triumph of the immanent that the transcendent no longer has a role to play in their lives. The triumph of the immanent over the transcendent has come at a high personal cost leading many to despair at the loss of meaning in their lives. This is where David Lose sees opportunity in the secularism that has come to dominate so many people’s lives, faith gains its relevance when it responds to the secular crisis of hope. In a world full of meaningless stories we are the bearers of an incredible story that does have the audacity to speak hope into hopelessness. Secularism has heightened our awareness of the mundane and ordinariness of life but particularly speaking from the perspective of vocation we have the ability to speak of the transcendent God who is present in the day to day tasks. Rather than restricting God’s activity to the realm of the church, Dr. Lose argues this frees us to point to the places God is at work in the lives of the people we encounter beyond the congregational walls. 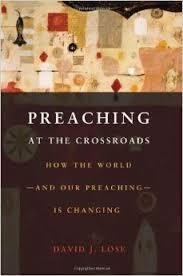 Pluralism is the final topic tackled in the final two chapters of Preaching at the Crossroads. With pluralism the place of Christianity is no longer privileged as the one dominant story but is rather placed along with countless competing narratives: some religious, others may be centered on nationality, wealth, ethnicity or even the narratives used in advertising to place a product. This has been heightened by the rise of the digital age where a more robust variety of stories are instantly available at any one time. In light of the near unending choices available the culture has shifted from one of obligation to discretion. Now the center of identity is no longer inherited but rather constructed by the choices of what one affiliates with and which stories one values. We no longer live in a culture that values tradition but rather experience is the touchstone of value in this age. As with the previous shifts, David Lose points to the opportunity in this movement as well. In an age where identity is constructed we have the ability to ask the questions of how to “meet their deepest needs, construct meaningful identities and experience the living God”. (93) In a time where Christianity no longer benefits from the society reinforcing our story it is a chance to help people find themselves in the story again and to tell our story in a way that helps people make sense of their lives. David Lose ends these chapters with some suggestive ideas of how participatory preaching might provide a space for people to make sense of their lives in light of the biblical story. David Lose’s book is a wonderful introduction to the interconnected movements of postmodernity, secularism and pluralism. It is a concise and quick summary that is helpful both for the preacher who has studied and lived with these swirling movements and for the student learning about preaching and wanting to understand the world that is changing around them. This was a book I wished I had years earlier but I am glad to have found as a helpful resource for today. This entry was posted in Book Reviews, Re-imagining Church and tagged David Lose, Pluralism, Postmodernity, Secularism. Bookmark the permalink.